This is a post explaining something called no-poo, but since it’s not well known I didn’t want to get you all nervous about what the heck you are about to read. It is not advice to eat 3 pounds of poutine and take a nap; it is a crunchy alternative to washing your hair with shampoo and conditioner. It’s ridiculously easy to do but not that easy to talk about unless you want to drop the lingo and just say, “I don’t use shampoo.” Let’s go with that for now. It all started in 2009 when I came across this idea on the internet and thought I’d give it a shot. I generally bought shampoo and conditioner on sale, but it never hurts to save a few bucks, and it never hurts to limit your exposure to chemicals, so I was intrigued and decided to try it for the month of May, after I graduated from university (an event which I rightly assumed would require many photos to be taken). Since then I haven’t really looked back – I have used shampoo on the odd occasion over the last four years, and I have tweaked my method over that time, but generally speaking I’ve been shampoo-free for four years and love it! 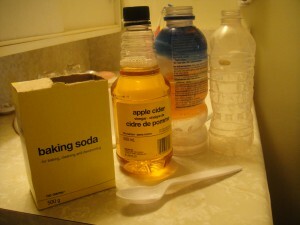 Prepare your baking soda wash: I put three tablespoon scoops of baking soda in a 591mL bottle then fill it with water. This is not an exact science, and it is where I spent the most time tweaking to figure out what works for my hair. The more baking soda you use, the more cleansing/de-greasing action you will attain. If you find that no-poo dries out your scalp you might be using too much baking soda or not rinsing effectively. Whatever your proportions, shake the bottle well to dissolve the baking soda. Prepare your vinegar rinse: I pour 3 tbsp or so of apple cider vinegar in a 500mL bottle and top it up with water. Again, so flexible – if you need more detangling and conditioning action, use a larger bottle with more vinegar. Wet your hair. I do this in the shower! I usually scrub my scalp with my fingers to make sure my hair is wet through and because it feels fantastic. Pour the baking soda wash into your hair, and massage the mixture throughout your hair, especially your scalp and roots. This is strange the first few times compared to shampoo because there is no lather, so it is more work and hard to gauge how effective you are being. Generally, in my experience, you will have done your job once your hair feels like a total bird’s nest. Rinse the baking soda as well as possible. Tangles may abound, but fear not. Apply the vinegar rinse – I usually pour half over my hair, comb my hair as best as I can, then pour the second half and comb my hair thoroughly to detangle it. Rinse the vinegar out thoroughly. Then you’re done! Shampoo chemically strips your hair and scalp of the natural oils produced by your skin, drying it out and stimulating your scalp to produce more oil. So you need to wash your hair more often. It’s a vicious cycle. 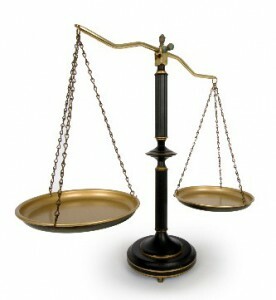 Baking soda, on the other hand, will remove excess oils and dead skin but not stimulate excessive oil production. It is antibacterial as well, so it truly cleans your hair and scalp and helps you not to smell. Vinegar is acidic, so it removes residue from your hair by reacting with any baking soda left behind. It also causes your hair cuticles to close (especially if you rinse with cool water instead of hot), which helps detangle and makes your hair shiny! Pro: A happy and healthy scalp means good-looking hair that doesn’t need a lot of maintenance. Pro: Cheaper than buying shampoo/conditioner. Pro: No concern about what chemicals are being put on my skin or breathed into my lungs. Con: Many people who no-poo experience a transitional time (from a few days to a few weeks) where their scalp is still overproducing oil and making their hair greasy. When I first started, I needed to no-poo more often than I used to shampoo until my scalp calmed down. To be honest, there were some bad hair days. Con: There is also the learning curve of what proportions of baking soda/water to use. Sometimes I underestimate my baking soda (since I don’t measure meticulously) and don’t get a great clean that lasts for days. Con: Time. Pre-mixing batches of diluted baking soda and vinegar means washing my hair with cold concoctions, and I am not down with that. I mix my mixes before each shower, which adds a few minutes to my total shower time. I also take an extra minute or two to really work in the baking soda and to comb out my hair. If I needed to be in and out of the shower in two minutes, I’d use shampoo. I have thick, mostly straight, shoulder-length hair. When my hair was longer, it was harder to get clean with no-poo because there is no lather. It’s still possible, but it takes more concoction and a little more work. I do not generally use heat to style my hair, and my hair is not dyed, so I can’t say how no-poo compares to shampoos/conditioners designed to protect hair from those elements. However, since going no-poo I have found my hair to be much more resilient against breakage and split ends than ever before. I can’t speak to its effectiveness for washing out hair styling product because I don’t consistently use any. The last time I used gel/hair spray/volumizing powder was all at once for a wedding and it was a LOT and I used shampoo to get it out. Shampoo does have a place, it’s just not in my day-to-day routine. I have read that some people need to re-transition every time they use commercial shampoo. My scalp is not that sensitive, so the occasional shampoo doesn’t really mess up my system. Phew! The knowledge! Any thoughts? Would you consider making the switch?